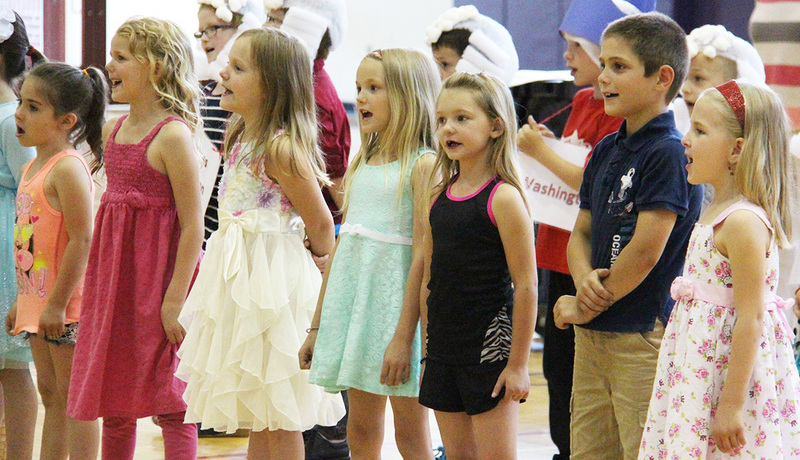 HANNIBAL – First grade students at Fairley Elementary recently captivated an audience full of family members and friends by showcasing the knowledge they’ve accumulated throughout the past school year. Fairley Elementary School first graders recently starred in a learning showcase at their school. Pictured, students sing in unison before hundreds of proud family members and friends. The event, which was attended by hundreds of proud community members, provided first grade students with a platform to perform a year in review presentation. The students starred in a bevy of educational-themed performances, including two charming and patriotic readers theater acts. Both acts depicted a turning point in American history. The first act recreated Betsy Ross and the creation of the American flag. The other act depicted the founding fathers appointing George Washington as the first President of the United States of America. During a recent community showcase at Fairley Elementary, first grade students exhibited what they learned over the course of the school year. 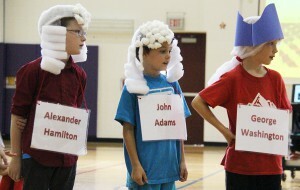 Pictured, students Nicholas Kaufman, Damen Hyers and Tannor Kelly depict the founding fathers.